Ms. Ryan is a 60-year-old female who was admitted to The Hamlet Rehabilitation and Healthcare Center at Nesconset on January 14th, 2019 after her stay at Stony Brook University Hospital where she was admitted for aortic valve replacement and mitral valve ring repair, acute respiratory distress and spinal stenosis. Within the first 12 hours of entering our community, The Hamlet Rehabilitation, and Healthcare Center at Nesconset, Ms. Ryan was evaluated by our occupational and physical therapy teams and was seen by clinicians, administrative staff and other valued members of the team. She was scheduled for therapy six times a week for four weeks. Ms. Ryan worked on ambulation, transfers, balance, strengthening and endurance training to improve her activity tolerance, functionality, and mobility while decreasing need for assistance with her activities of daily living. When Ms. Ryan first came in, she presented significant functional decline with generalized weakness, deficit in strength, balance, endurance, and activity tolerance. Ms. Ryan required moderate assistance in safely performing bed mobility tasks. She was able to safely ambulate 5 feet and was unable to ascend/descend any steps with independence. Within three weeks, Ms. Ryan was able to safely ambulate on level surfaces 100 feet and one week later was able to walk 175 feet. In addition, Ms. Ryan had some difficulty ascending and descending steps; however, after working hard for two to three weeks, Ms. Ryan was able to ascend and descend the necessary amount of steps for her to have a safe discharge home. With all of the teamwork and cooperation of the team at The Hamlet, Ms. Ryan was in-serviced on safety, sequencing, and energy conservation techniques. Her therapist came up with a few techniques to use for safety upon her return home, and on February 14th, after successfully achieving all of her goals, Ms. Ryan was discharged home. We wish Ms. Ryan the best of luck in the future. Mrs. Belonzi is an 86-year-old female who was admitted to The Hamlet Center at Nesconset on September 13th after her stay in Brookhaven Memorial Hospital for chronic obstructive pulmonary disease, urinary tract infection, difficulty in walking, and congestive heart failure. 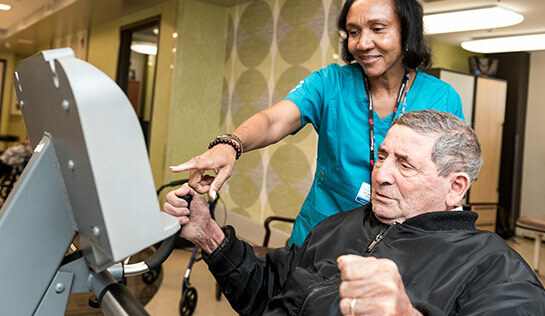 After her hospitalization, Mrs. Belonzi needed extensive inpatient rehabilitation to safely perform functional transfers with minimum assistance, push up from arms of chair, and for safety while turning while maintaining oxygen saturation of more than 90% and use activity pacing. In addition, she needed to safely perform toileting tasks using standard commode with minimum assistance for safety awareness, for use of energy conservation techniques, for proper sequencing and for safety while turning with reduced risk of falls. Within the first 12 hours of her admission to The Hamlet, Mrs. Belonzi was evaluated by the team from occupational and physical therapy, as well as other valued members of the team who welcomed her and answered any questions she had. Her main goal for discharge was to be able to perform functional transfers, and to safely ambulate on level surfaces of 200 feet with safety during turning 100% of the time. This was a tall order as the goal of the therapy team was to also maintain oxygen saturation of more than 90% and perform functional mobility during activities of daily living for use of energy conservation. The clinical team also worked on building a plan that would support breathing techniques in order to return her to her prior living and supervision levels. The team had many goals, but a lot of ambition and excitement to support Mrs. Belonzi’s recovery and hopeful anticipated home! The occupational and physical therapists focused on positioning/ pressure relieving techniques, proper body mechanics, safety sequencing techniques, safe transfer techniques, safety precautions and use of an assistive device in order to increase safety and decrease her need for assistance! The goals and status were becoming more and more of a success! With all of the teamwork and cooperation provided by our team and constant encouragement during each therapy session, Mrs. Belonzi was provided with a pleasant experience as opposed to simply a hospitalization. We wish Mrs. Belonzi a safe return back to The Arbors Assisted Living Facility! Posted in In the Press, News and Events	| Comments Off on Have You Heard The Hamlet Rehabilitation and Healthcare Center at Nesconset On The Radio? Mr. Pierce is a 74-year-old male who was admitted to The Hamlet Center at Nesconset after 18 days at Stony Brook University Hospital where he was a patient from April 7th through the 25th. Upon admission, Daniel was dehydrated and malnourished. He was diagnosed with Achalasia, Acute Respiratory Failure, Fall Risk, Syncope, and admitted on April 25, 2018 for physical therapy. Prior to Daniel’s admission, he underwent surgery on his esophagus where they cut the muscle from the top of his throat to his stomach in an effort to prevent him from choking. Prior to that time, he could barely eat or drink without choking. From April 25th through the 27th, the patient was simply on clear liquids. He was then upgraded to a pureed diet until June 7th. At that time, he was placed on a regular diet and continues to do well! He was physically weak and needed to build his strength, so he attended physical therapy sessions daily six times a week for four weeks from April 26th to June 22nd! Overall, Mr. Pierce has worked extremely hard during his time here at The Hamlet, and his positive attitude and desire to help his unit mates is genuine. He continues to progress well and will have follow-up appointment with his physicians in the community to monitor his program and healing. Daniel has an artistic side, and enjoys working with markers and building beautiful paintings. He has also shown a special talent aside from the art of painting and drawing, by sharing his incredibly talented voice during Family Karaoke night. Daniel became a part of The Hamlet family.When he will be discharged, Daniel will definitely be missed by the team here and the friends he made during his healing journey with us.